Chinese New Year, which is February 16. 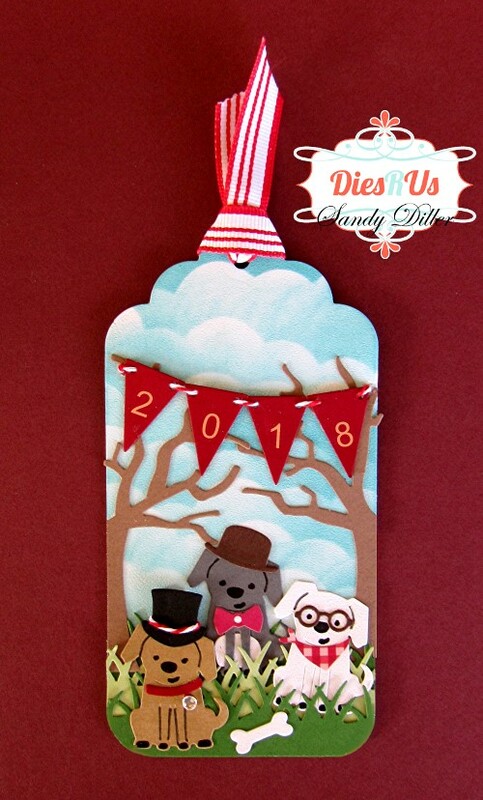 2018 on the Chinese calendar is the Year of the Dog so how could I resist using the adorable dog from Karen Burniston's Cat & Dog die? I started the tag using the large tag from the Tag Book Pop-Up, cut from white cardstock. Using the Nature Edges Die, cut three strips of grass. Cut one tree using the Tree Pop-Up and then cut in half as shown above. Now cut three dogs from the Cat & Dog die using three different colors. Color the faces in using the die as a stencil. Using the Nature Edges, cut the cloud die from acetate and use as a stencil to color the clouds on the tag. Broken China Oxide Ink was used here. Simply move the stencil down at different angles and rub the ink on using a circular motion. Next, layer on the rows of grass and trim to fit tag. Now add the pups and the trees. Using the Tiny Accessories 1 die I dressed the dogs. The bandana, collar and bone all come with the Cat & Dog die set. To finish off my tag, I used the banner from the Twist Panel Pop-Up on some twine. It was added to the tag to look as if it is hanging from the trees. Stickers were used for the numbers. Look at all of the detail on this gorgeous tag. Love the realistic clouds and the cute and fun dogs. The addition of the hats and a scarf on the dogs really makes this outstanding. OMG how adorable and I love that you dressed them up! What a clever and cute tag! Awesome inspiration ... well done! Love your tag. It's just too cute! Those pups are adorable! What a super cute tag Sandy! Love those dapper little pups! your clouds are amazing as is the rest of the tag! all the details are fantastic!